The X-Caliber Adapter allows shooting 380 ACP centerfire pistol cartridges through any break-open action 12 gauge shotgun. The X-Caliber Adapter allows shooting 9mm Luger centerfire pistol cartridges through any break-open action 12 gauge shotgun. The X-Caliber Adapter allows shooting 357 Magnum and 38 Special centerfire pistol cartridges through any break-open action 12 gauge shotgun. The X-Caliber Adapter allows shooting 40 smith and wesson centerfire pistol cartridges through any break-open action 12 gauge shotgun. The X-Caliber Adapter allows shooting 44 Magnum centerfire pistol cartridges through any break-open action 12 gauge shotgun. The X-Caliber Adapter allows shooting 45 ACP centerfire pistol cartridges through any break-open action 12 gauge shotgun. The X-Caliber Adapter allows shooting 410 shot shell and 45 Long Colt cartridges through any break-open action 12 gauge shotgun. 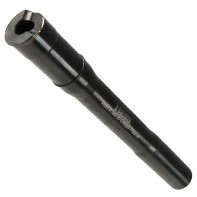 The X-Caliber Adapter allows shooting 20 gauge shot shell cartridges through any break-open action 12 gauge shotgun. The X-Caliber Adapter allows shooting 410 shot shell and 45 Long Colt cartridges through any break-open action 20 gauge shotgun.